“I know what you are!” my friend Lynn Keegan exclaimed on her second visit to my home. “You are a Bohemian!” I blinked in surprise. “What was a Bohemian,” I wondered. I had heard the term but wasn’t sure if it was a compliment. I knew Lynn was interested in my lifestyle and my work but this was her first assessment. As a holistic nursing consultant, she had traveled from her home in Washington State to be a guest at our Oregon Holistic Nurses Association (OHNA) held each year at Breitenbush, Oregon. I noticed that she was always looking around and seemed to wonder out loud about some things but she blew me out of the water (sorta speak) with this pronouncement. I did some research: Bohemianism emerged in the early nineteenth century France when artists moved into the lower-rent Romany (gypsy) areas of Paris as they sought out alternatives to bourgeois expectations. Artists from all over the world, most with very little income, tried to make their art and eke out a living in this part of Paris. A feature of this lifestyle is that the pursuit of wealth and other traditional indicators of success were abandoned in favor of a creative life and an active engagement in the search for alternative ideals of beauty. Yep, she got that right, that is me, an artistic hippy or artistic alternative practitioner. 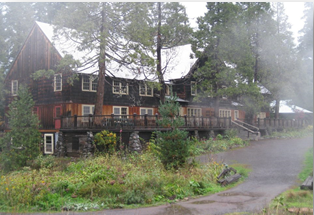 Deep in the heart of the Cascade Range lays a wonderful forested retreat and conference center named Breitenbush. Who would guess that holistic nurses meet at this Bohemian lodge with its simple rustic design every year? This intentional community is blessed with beauty and magic and there is artistry and creative expression everywhere. Many artists and craftsmen live right there on the grounds…many have lived there over the 40 plus years of its existence. On the other side of the river, from the lodge, is a community of small homes where the Breitenbush employees live and love. There are a number of yurts of all different sizes and materials plus older cabins. I understand that they are building more uniquely designed structures for their growing needs. In the sunny areas of this community, outdoor gardens of vegetable and flower dot the forest landscape. 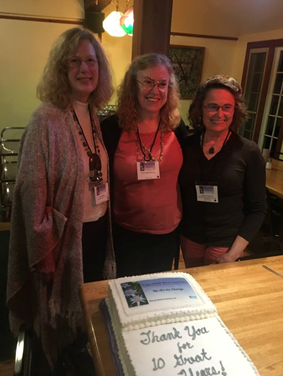 On October 22, 2017, the tenth anniversary of the Oregon Holistic Nurses Association, holistic nurses gathered together for a wonderful time yet again. Many of the original team was there and some are still on the governing board. As the founding director of OHNA I helped to build the infrastructure such as the basic web site, a brochure, gathered the first board of trustees and brokered communication relationships with Breitenbush staff. After three years, Deonne Bone Wright took over from me bringing her knowledge of nursing education to move the nurses’ retreat into the arena of a conference as well as a retreat. Since then it has flourished and we are all very proud. Currently, Marina Ormes, a nurse astrologer, is the director. She says that whatever theme OHNA offers next year will be according to her astrological interpretation. That’s all I know. We will have to wait to see what that turns out to be. 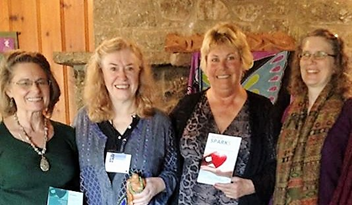 Anita Stewart, a newer member of OHNA, introduced several of us to a group in Eugene with the name, Authentic Messengers that could help us put together a book; “Nurse Sparks” an anthology of nurse stories. Some of the authors were at the conference along with the finished book. The words on the back of the book say it all: Every Nurse has an event in their career that changes the way they practice nursing; an experience that moves them to tears or ignites soul. “Nurse Sparks” is filled with stories of nurses from across the nation, stories that reveal what it feels like to be working in a field that takes all of your heart and soul on a daily basis. A career that sometimes takes one to their knees, sends one home crying, exhausted, and spent of all energy. Or one that uplifts, opens the heart, inspires and illuminates. These events connect nurses to their inner resilience and touch the lives of so many in enormous ways. 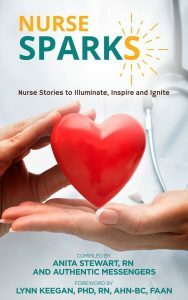 Each contributor to this book has a story that forever changed their life in a way that influenced their personal nursing practice and the lives of their patients. Purchase the book and their worlds will inspire you as well. Our friend, Lynn Keegan one of the founders of the holistic nurses movement, again for the third time, made the arduous seven hour trip down from Port Angeles to be with us. She graciously gave us her stamp of approval by writing the forward to the “Nurse Sparks” book. She is great fun, maybe she should consider moving closer. Nurse Sparks Authors at the conference: Deonne Wright, Toni Gilbert, Anita Stewart and Marina Ormes. All in all it was a creative time with superb presenters and soaks in the natural hot springs, book sales and an evening of sharing our healing arts. Breitenbush and the surrounding natural cathedral forest calms and relaxes us which helps to invite the healing process into our lives. Yep, we are a bunch of eclectic free-spirited Bohemian nurses and proud of it. Blakeney, J. (2015). The New Bohemians: Cool & Collected Homes. New York, NY, Abrams. How incredible to share space with others who truly understand and honor each other for their strengths and for their journey. Maybe someday I’ll get to be there to join your Bohemian vibe. Sharing with my folllowers!